A while back Gary Marcus gave a talk Making AI More Human, which I previously dissected here. In this presentation Marcus presented the notion that “what we wanted was Rosie the Robot and instead we got the Roomba”. This was a tongue-in-cheek paraphrasing of Peter Thiel’s well-known quote “What we wanted was flying cars and instead we got 140 characters”. Remember that Marcus is in the business of selling “better AI”, so it’s in his interest to paint current AI research as being sub-par. There’s no denying that the progress in Strong AI has not advanced as quickly as Weak AI, although this could be construed as a tautology of sorts. The vacuum is inside me! Driving this point home, Marcus includes numerous videos of falling robots. Although good for a cheap laugh, this montage of unstable anthropomorphic robots has deeper significance: the depths of our egocentrism. So many resources go into building robots in our image, but this is ridiculously hard (consider the millions of years it took evolution to yield homo sapiens). In design and engineering, mimicking nature can be useful, but why borrow from humans a bipedal skeleton and corresponding locomotion? We marvel at how unique humans are for standing on two legs (in terms of mammals) and the amount of time it takes to learn how to walk. Compare this to ungulates that can walk on their first day. Anthropomorphic robots are a good academic exercise, but in terms of pragmatism they are a bad idea. And that brings us to the Roomba. 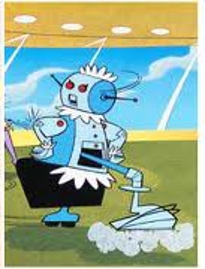 A while back I was talking with Bud Mishra and he also mentioned this dichotomy between Rosie the Robot and the Roomba. But instead of interpreting it as a failure of AI, he had an altogether different interpretation: that humans are bad at predicting the future. In other words, back in the 1960s we thought that automating domestic work meant a robot that did all the domestic work like a human. But that’s downright silly. Why would the vacuum cleaner stay the same if we had the technology to build a robot that can vacuum? The same is true of flying cars. At first blush Thiel’s quote seems like a stinging criticism of the lack of progress and “big” ideas. But flying cars, really? We’re entering the dusk of the personal automotive era, so what use are individual flying cars? What this shows is that AI is not failing. Indeed, AI is doing exactly what it’s supposed to do in terms of solving practical problems right now. Those focused on solving 50 year old ideas run the risk of missing out on the future by clinging to the past. It seems like all of the “robots” of the past were gigantic and had humanoid features! We were never able to quite figure out the notion of small special purpose bots. Or even compact electronics for that matter.